⚓ T123086 Titan AA lock position? Errors capture target AA. Often the goal line of sight, but the capture is not working, or capture leads away from the goal. General and landscape 2000-12000. In all situations, it captures the problem occurs sooner or later. Capture sometimes works, sometimes does not work. Many times tried in the editor, everything always works differently. I do not see, depending on the situation, I see the relationship when the target is in motion. I tried with helicopters. When the helicopter is not moving - everything works well, at any distance to the target. Any reliance on visual range. But once the target starts moving, things are changing, there is a problem with the grip. 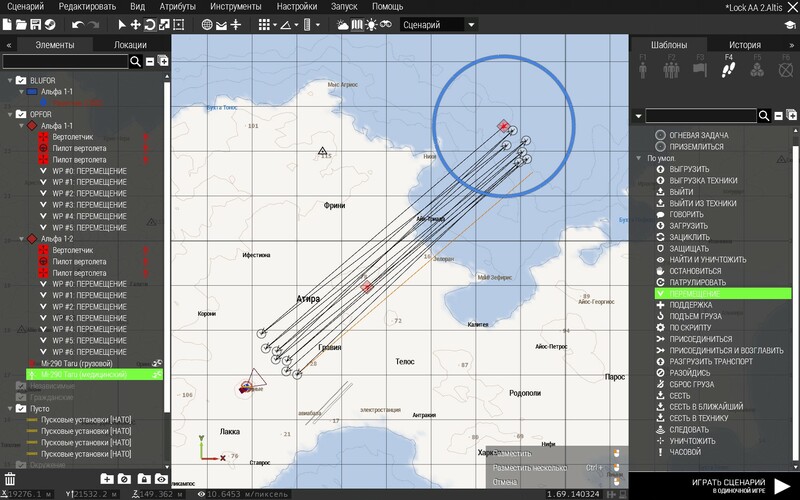 Create multiple aircraft, the height of 500m, ask them waypoints height of about 500m of your deployment. Try a takeover target when you see it. I noticed when the game settings, the range of total visibility 12000, target acquisition works well, but at a distance to the goal ~ 3000-4000m square capture often is not on target, but the sound is ready capture works well. I did the test with fixed helicopters. The farthest distance of ~ 5000m. Capture works well. But there are two helicopters, at a distance of ~2100m and ~2400m, which could not capture. What happens to the capture of targets at distances of ~2000m and ~2500m? Thanks for detailed testing. SAME BUG FOR TITAN AT BTW!!! The error of capture of the purpose appears in the strange way. I several times, start of a mission in the editor. Each start differently reproduced a problem. It needs several starts of the test to find and see as it appears. Lex added a subscriber: Lex. Yesterday, after the DEV updating the problem is reproduced in the editor. The only thing that has changed when I recharge titanium of AA, and the purpose remained in the field of my sight, the procedure of capture is resumed, automatically. He made a few more tests. It seems there is a problem in the following order. When I took aim at the castle, but the goal went the distance longer permissible for a shot (or sometimes an intermediate barrier) capture is lost. When the target returns to the distance that is acceptable to capture procedures (or sometimes an intermediate hurdle not interfere), the capture of the procedure does not work, or draws a dotted square far from the goal of a true dislocation. Even at a distance of 1000m, and less could not take aim. What's status razazel? Bohemia found the exact cause of the the bug and is fixing the code right now? I expect a fix until this weekend. It has been several weeks now. Positioning the helicopter on the map traced bad. Even at a small distance to the helicopter, the helicopter positioning on the map easily stopped. capturing procedure is stopped at the last point of fixation of the helicopter on the map. This video was recorded today, DEV 169.0.140.324. Adjusts the overall visual range in the game 12000m. Capture procedure does not work well, and often has a tendency to loss of capture. This issue will be released as is, without changes to Arma3 1.68? It is absolutely incapacitates the air defense system. This comment was removed by Lex. Video is recorded in Arma3 RC. Range of total visibility of 6000m. This bug has always been present to a certain degree (even in Arma 2 and prev. games, just a bit less frequent). The main issue of the system is that it uses the general target knowledge. The "Sensor overhaul" planned for Jets DLC release solves the problem. It uses a new, different approach giving each weapon or vehicle its own target detection rules. Btw profiling exe working fine with Titan AT lock on now. Haven't tried Titan AA yet. From ten possible 100% of the attacks on the purpose, successful two captures. From two successful captures of the purpose, from two rockets - 1 rocket has hit the mark. It leads to an imbalance in a game, loss of advantage which could will take place. Solve this problem, it really irritates. The air attacks of the opponent, spoil a game, due to the lack of a way of fight against air targets. Thank you very much. In DEV of the version works well. Nobody use drones on low altitude... AA tank and AA launchers now unusable. The problem could be the IR signature of the drone. if its too small the Launcher cant lock it. BIS planned fix this problem? Or we have to change mission parameters? oukej changed Resolution from Open to Fixed.